Skillet Chicken and Broccoli Veggie Tot Pie is the ultimate fast and easy, family-friendly, one-pan comfort dish! Made in a skillet with chicken breast, celery, carrots, and broccoli, then finished in the oven with broccoli and cheese veggie tots. Similar to a chicken pot pie or shepherds pie, but with veggie tots in place of crust or mashed potatoes. When I played around with this idea, I wasn’t sure how it would turn out, but Tommy and Madison loved it – win, win in my book! The veggie tots are new from Green Giant, they have cauliflower tots, broccoli tots, but the Green Giant Broccoli and Cheese Veggie Tots are by far my favorite. I often make veggie tots from scratch with all sorts of veggies, if you’ve been following my blog for a while you may have tried them. 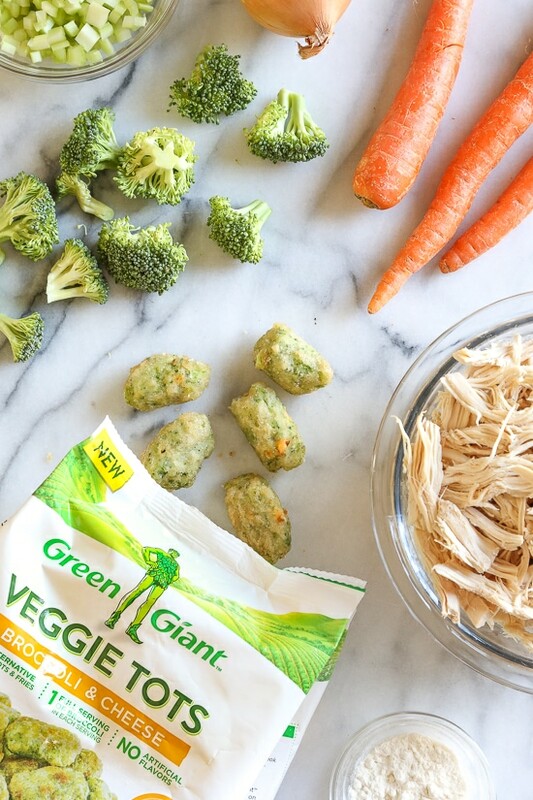 But for convenience these veggie tots from Green Giant are a huge time saver and a great alternative to tater tots. This whole dish came together in less than 30 minutes! I always have shredded chicken on hand, I make it every week in my slow cooker by covering the breasts with water or broth and cooking it high 4 hours. You can also use leftover rotisserie chicken here, both would work! And last, here is a $1 off discount code for the Green Giant veggie tots. If you make this let me know what you think! 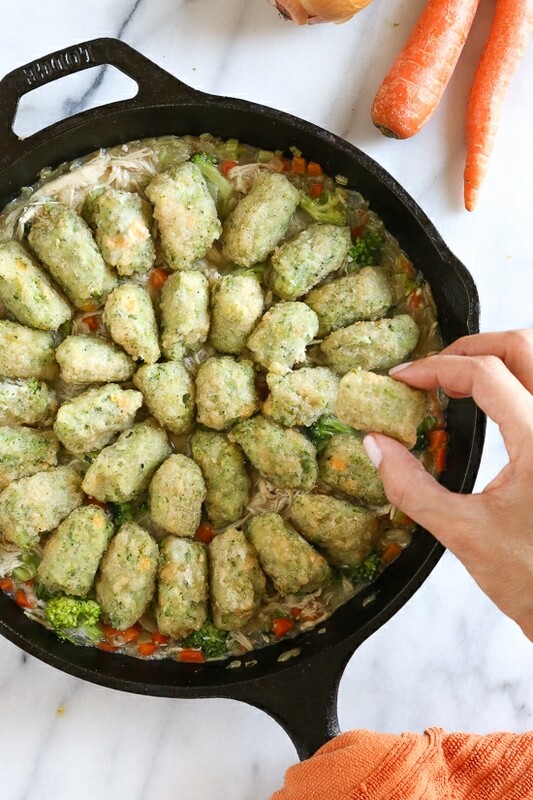 Skillet Chicken and Broccoli Veggie Tot Pie is the ultimate fast and easy, family-friendly, one-pan comfort dish! Made in a skillet with chicken breast, celery, carrots, and broccoli, then finished in the oven with broccoli and cheese veggie tots. Heat a large oven safe or cast iron skillet over medium heat, melt butter. 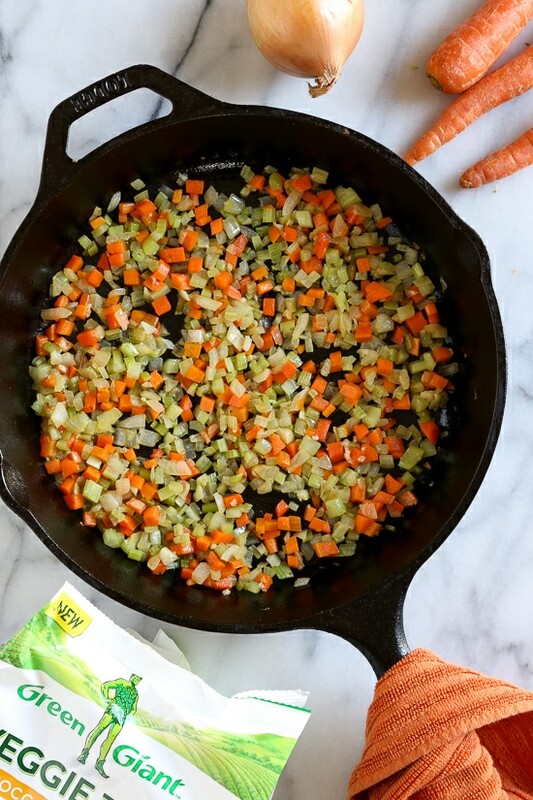 Add onion, celery, carrots and parsley cooking until onions are translucent. Add minced garlic, cooking for an additional minute. Sprinkle the flour over the vegetables and stir. Pour in the broth and stir mixing 1 minute. Add the chicken, broccoli, 3/4 teaspoon salt, pepper, thyme and cook medium heat, bring to a boil then cook until the broccoli is tender-crisp, 2 to 3 minutes. Top with Green Giant Veggie Tots and place in the preheated oven 16 minutes, until veggie tots are crisp and hot. Disclosure: I partnered with Green Giant to develop this recipe. Thank you for supporting the brands that make Skinnytaste possible. All opinions are my own. I made this and it was a hit. The only change I made was to leave out the thyme and I added about a tablespoon of the powder Hidden valley ranch. Husband loved it, and I will definitely make it again. This was so good!! We ended up making it twice in one week. Tasted like chicken pot pie. My husband keeps on questioning me if the skinnytaste recipes I make are actually healthy because they taste so good we feel like we’re splurging. Love! I tried this for dinner tonight! My husband and I loved it! Can’t wait to make this again! It was so easy and filling! Did you put anything else with it like a salad? I made this as it was wonderful. The tater tots was almost like the real thing. My husband didn’t notice that it wasn’t potato. Will do this one again. I plugged in the ingredients though and it comes up as 7 smart points. Yet another skinnytaste winner!! I made this for the first time recently. When I put it on the table, my husband took one look at it and said, “Yuck”. However, he took one bite and LOVED IT!! Since we are a Weight Watchers couple, we try to stick to the recommended portion sizes. He couldn’t help himself with this one and went back for seconds. Thank you for all the wonderful skinnytaste recipes that have helped us to lose weight while eating scrumptious food!! Glad you both enjoyed it Carla! We love this! Quick, healthy and tasty! My seven year old loves it! Sorry Karen. Are you using the recipe builder? This was great!!! Thanks for the idea! Your recipies are amazing! Please keep sharing!!! I just put your nutritional information into the WW recipe calculator to confirm the Freestyle Points – you say there are 6 points per serving. If you go by their app calculator, it comes out to 9 Freestyle Points per serving. What “calculator” are you using to indicate the FS Points? The calculator is not accurate for freestyle points when the nutritional information includes zero point ingredients. These ingredients still have nutritional values, but they’re free. You would have to use the recipe builder to get accurate freestyle points for a recipe. ESY and yummy recipe, that’s. Oth my husband and I enjoyed. Quite filling too. I oubled up on the veggies, except the broccoli, but I used about 2 cups of that, and increased the flour and stock by 1.25 and it all worked well. 5e thyme adds a nice flavor (I used dried crushed thyme). I have yet to try a skinnytaste recipe that we haven’t liked! Thank you!! Apologies for the typos. I need to check the before hitting “send”. This was quite good. A little too heavy on the thyme for my taste, but a really satisfying meal that used up some leftover roast chicken we had. My husband disagreed with me on the thyme and thought it was just perfect. I had been wanting to make this recipe, but had put off for some reason. I wish I had made it sooner! There is so little butter and flour, and yet it makes a delicious and decadent gravy! I loved the addition of broccoli in the vegetables, and the broccoli and cheese tots were so much fun! what size cast iron skillet is this? I just made this tonight with leftover turkey and my loved it! I will be honest, when I saw this recipe, I had my doubts, but… Oh my goodness, this was SO GOOD!!! Those broccoli cheese tots definitely hit the spot. Thanks, Gina! This recipe was so good! I had leftover Rotisserie Chicken, so this recipe fit perfectly! One note though – When I went to track it for WW (Smart Points), in the app, it tracks as 9 SP per serving, not 8. Just in case anyone out there is also tracking 🙂 Can’t wait to eat this again for lunch tomorrow! I made this tonight for the first time; the whole family enjoyed it. A great meal to ‘hide’ veggies for my little one. I’ll make a few tweaks next time, the veggie tots were not as crispy as I would have liked. But two thumbs up from my family! This was delicious and so quick to put together! My husband even admitted it was good, and he “doesn’t like” about half of the things in the recipe. What a fun and creative use for the tots!! It reminded me a little bit of chicken and dumplings, only it felt a lot fresher and lighter. So so good! And two out of three kiddos loved it which I see as a success! Very good! I used the green giant riced broccoli and cauliflower steam bag in place of broccoli, which made it even faster. My husband loved it also, this is the third skinnytaste recipe he’s raved about! The tots give it that extra crunch too. Will definitely make again! This was really easy and amazing. My husband loved it as well. I ate two servings it was so good. I will definitely make this again. I just made this and it was SO easy and AMAZING! It’s going to become a staple in our house! For the vegetarians out there — I subbed the chicken with “bacon” tempeh with great results. Ends up at 7SP instead of 8 per serving, too. Absolutely loved this. Husband and I decreed this as one of our new go-to meals. I did some pre-prep chopping the night before, and it all came together beautifully and easily. I am obsessed with these tots! I’ve just been simply baking them but can’t wait for this fun twist! Thanks 🙁 trying this week! This looks AMAZING!!! Is this good reheated? I was thinking of making this and eating it over 4 days as leftovers. i made this for lunches this week and it’s been great reheated. less crispy but still delicious! Wonderful! We loved it. I used Imagine no chicken chicken broth to saute veggies and for the broth, used quorn chicken tenders chopped up even smaller rather then chicken as I needed to make this vegetarian. Really couldn’t tell it wasn’t chicken. We will make this often as written and as a vegetarian enter too. Do all Veggie Tots have cheese in them? Do you know of a gluten free, dairy free version? This is so good. One of our favorites of yours that we’ve made! I’ve made your broccoli cheese tots several times and they are so good! I tried the Green Giant tots..yuck! Not even for a recipe. I would make my own broccoli tots if I made this. Just made this for dinner and it is delicious. My husband loved it too. Only changes I made were I used fresh tyme and I put under the broiler for a couple of minutes to brown the tots. Gina, I just want to thank you for sharing all these wonderful recipes with us! I am 66 years old and joined Weight Watchers in November 2016. Your recipes have helped me lose 31 pounds so far! My husband and I both love you recipes. At my WW meetings I tell everyone how good your website is and how you post the Smart Points. thank you, again! I just made this for me and my husband yesterday and we loved it! Very yummy! I finally got around to making this and wow! It was so easy and was on the table in a flash. Gina, you never fail to disappoint. This was delicious! This was such a fantastic meal. Quick and very flavorful – total win. Just finished this dish as tonights dinner. SO GOOD!!! 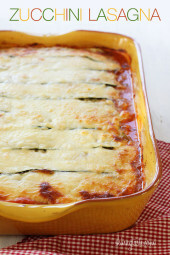 Thank you, we enjoy many of your dishes, and any time I tell my husband I am making a SkinnyTaste.com recipe, he knows it is going to be delicious. Yikes! More than 1000mg of sodium? Is that due to the packaged veggie tots? Do you have any suggestions for reducing the sodium? Thanks. Yes, I tried making this with less salt but it was bland. You can use the broccoli tots with no cheese to reduce it further. I tried these Green Giant tots tonight after seeing this recipe, and they are amazing! It’s the first time I’ve gotten a completely new thing from the grocery store in years! I can’t wait to use them in this recipe. 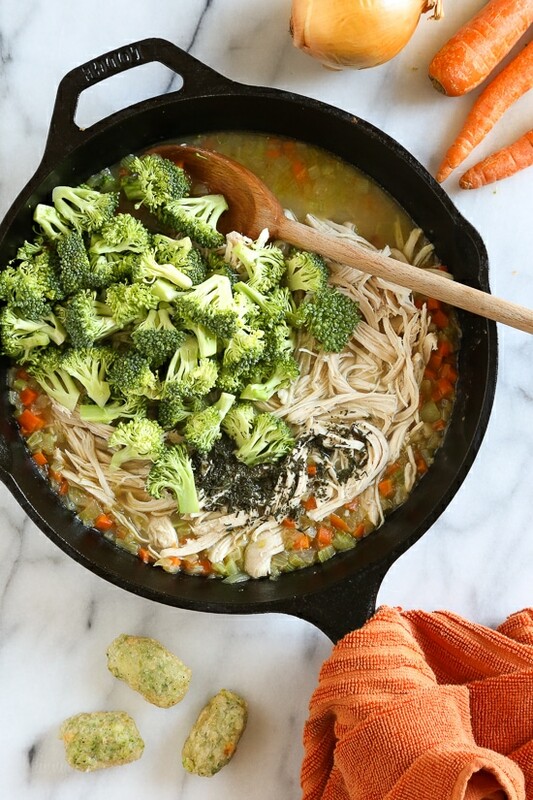 Do you think after cooking the chicken and veggies in the skillet, I could transfer everything to a tin foil casserole dish, let it cool, top with the broccoli tots, cover and freeze? Then thaw and cook as directed at a later date? 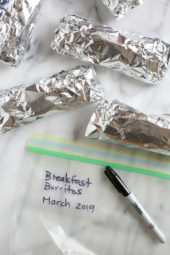 I’m always looking for delicious and easy freezer meals, and this seems to fit the bill! Sure I think it would be great! This sounds just like something I’d enjoy. Until reading this I never even heard of frozen veggie tots. I have a feeling if they aren’t already in the freezer section of our local grocery stores it may take some time before I see them. SO my question is if I make my own would I bake them first OR make them up to bake with the whole dish once it goes in the oven? I would make them first so they brown, then continue with the recipe and cook them less time in the oven. Looks awesome. I LOVE these veggie tots. Here is what I did the other day using these…a twist off the old recipe of tator tot hotdish. I sauteed onion, carrots and red peppers, added ground turkey. Stirred in two cans of low fat cream of celery soup. Spread into a baking dish and topped half with the broccoli and half with the cauliflower veggie tots. AMAZING…….Come up with something like that not using the soup maybe?? The cauliflower tots would pretty much fool anybody into thinking they are potato. Wow way too much sodium in those tots for me; I would stick to making my own! Great idea for the dish! This looks delicious. Gina, where can I buy a pre seasoned cast iron skillet? Lodge makes one I believe. Go to Amazon! Made this for dinner tonight. As I expected, another wonderfully tasty dish by Gina! It really was a great go to for a comfort food meal. My entire family loved it. Thanks Gina!! 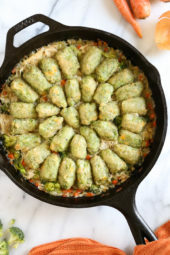 Could this recipe be doubled and after cooking on the stove put in a 9×13 dish to bake? I have 3 teenage boys who love to eat! We love the Green Giant Cauliflower Rice! This looks/sounds amazing! I do not have a cast iron skillet 🙁 Could I transfer to a 8X8 or 9X9 when its baking time? I love the new green giant broccoli tots! Now I have a delicious new recipe to try! 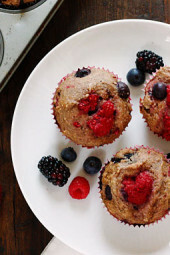 Do you know if you can replace the flour with Almond flour? When possible, please tell which one of your cookbooks the recipe is in. This is a new recipe, not in my books. I just noticed my grocery store has these and have been waiting to try them. This recipe sounds perfect!